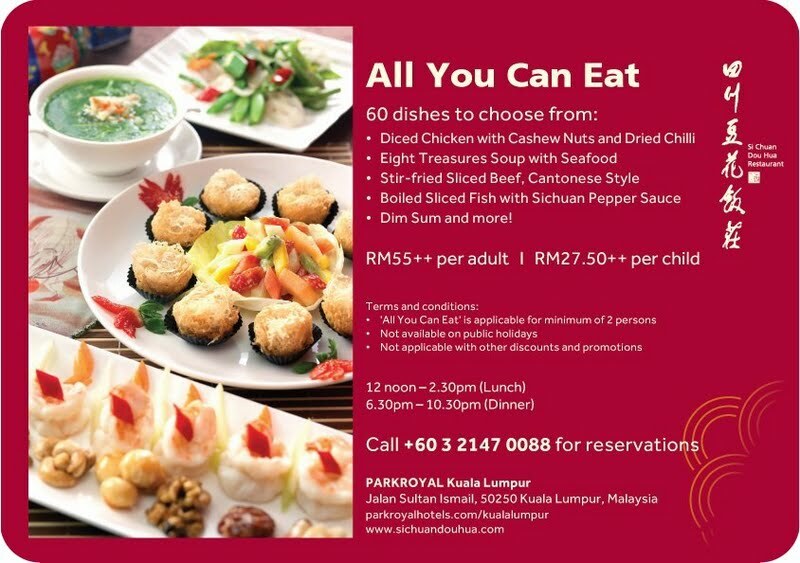 CHASING FOOD DREAMS: Si Chuan Dou Hua Restaurant, PARKROYAL KUALA LUMPUR: All You Can Eat Sichuan Cuisine Promotion! 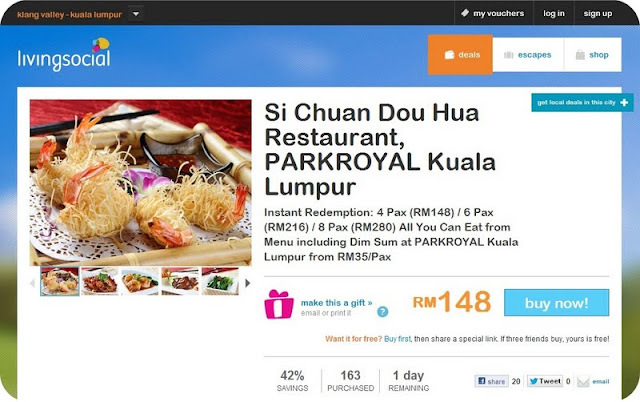 Si Chuan Dou Hua Restaurant, PARKROYAL KUALA LUMPUR: All You Can Eat Sichuan Cuisine Promotion! Get Heated Up with All You Can Eat Sichuan Cuisine Promotion! When I heard it was All You Can Eat Sichuan Cuisine, my heart skipped a few beats! I am a huge devoted fan of Sichuan cuisine. Spell it however you like, Sichuan or Szechuan, the ‘Chuan Chai’ is notorious for its numbing sensation from the Sichuan pepper in most of their signature dishes. Fear not if one cannot take the heat as there are also some famous dishes without the numbing pepper though Sichuan flavors tend to be stronger than Cantonese cuisine. Si Chuan Dou Hua Restaurant in PARKROYAL KUALA LUMPUR is famous for their refine Sichuan dishes. No introduction needed, several foodies or gluttons round up at the restaurant for their awesome All You Can Eat promotion recently. The promotion is simple… Eat All You Want from their list of 60 dishes. Enjoy this during lunch or dinner and minimum requirement is 2 pax. The promotion is not available on public holidays and not applicable with other discounts or promotions. Price is RM55++ per adult and RM27.50++ per child. Decent since this classic pickled octopus is standard in flavors and textures… I still enjoyed this! Unpretentiously simple but flavors are sour and a little spicy. The thick chewy jelly fish is juicy and gives the jaw some good exercise. This one stole the show that night! Chilled boneless chicken poached and drenched in a pungent super spicy Sichuan pepper sauce is guaranteed to knock your senses out of the ball park. Simply not for the faint-hearted, this dish is the epitome of Sichuan cuisine. It may numb your senses and lips but it is also equally awesome in flavors with its slight lemony hint! Delicious! Sweet minced prawn paste draped with crispy thinly shredded phyllo sheet makes great dim sum snacks. Recommended only if you have a least four or more foodies to share as this puff is huge! We could barely touch this as it arrived almost at the end of the meal and we were stuffed to the max by then. Basically it’s a bun encasing sweet mixture of chicken, glutinous rice, lotus seed, pineapple and sweet root vegetables. A wee bit too sweet for my taste since I prefer savory flavors. Kudos to the chef for the crispy light batter encasing sweet bouncy prawn paste! Scrumptious enough but to make it even more awesome, I need more wasabi mayo and wasabi flavor. Surprisingly charming since this is a Shanghai dish rather than a Sichuan specialty. Juicy, thin skin, savory sweet meat filling… just needed more broth to hit the signature note. Given the fact that this is one of the better ones besides the Xiao Long Bao experts in the market, I thought it was yummy! I couldn’t really taste much shark fin here but I can’t complain for the price. The thick broth is nice enough with crab meat and some bits of jelly fish. I liked mine drizzled with a little black vinegar. A house signature, the classic is a medley of sour and a little spicy in flavors. Consisting of its usual slivers of meat and vegetables, there is an addition of bean sprout for some crunch factor. If there is one soup you can only take, order this one! Brimming with sweet oceanic scallop and crab meat in spinach bisque, the delicate soup is so tummy warming. The natural sweetness from the spinach and seafood is beautiful and hearty. No wonder it’s a popular choice at the restaurant! A clear chicken consommé held floating pieces of minced fluffy chicken, crunchy bamboo pith and greens. A classic rendition of fresh sweet corn bisque with bits of crab meat, offering guests a natural and wholesome flavor notes in the bisque. This is what I came for and this is what I shall revel in! Slices of tender beef soaked gloriously in a famous Sichuan method called ‘Sui Zhu’. Another spicy dish, be prepared to get heated up with the familiar numbing pepper sauce. The flavors are complex with multi layers of pungent flavors from garlic to onions and the spicy element of the Sichuan pepper. What others might label as pain, I label as excitement of flavors! Nicely executed, the chicken pieces were coated in a light batter and covered in the familiar sweet and sour sauce. This was accompanied by onions, pepper and tomato. Easy to enjoy as the flavors are well balanced. Hand me a bowl of rice please… the dish is not famous for nothing! Crisp cubed chicken smothered in a mount of dried chilies and Sichuan pepper is absolutely aromatic. Expect powerful spicy and salty flavors with plenty of numbing effect! I expected a more pungent and robust sauce to accompanied the steamed Patin fish but it took the wrong turn. The sauce was too mild to bring out the flavors of the heavier flavored Patin. Variety of fish depends on the availability of the day. This one made me a happy camper! Despite the heat, I could taste the sweet undertone of the white fish. Just as the Boiled Beef, this one is very spicy, flavorful and garlicky. I would have been happy with this dish alone and a bowl of steamed rice! Succulent bouncy de-shelled prawns are smothered in a medium flavored garlic and chili sauce. It had a good garlic presence but with a mild heat only. I am told this is very popular with guests… I can see why! I like this concoction of ‘Kung Pao’ sauce using prawns. It had a sumptuous savory taste with a spicy heat level. Nice breath of wok detected in the piquant dish making it quite addictive. My only gripe… where’s the cashew nut? Butter Prawns never fail to impress my taste at the restaurant! Creamy buttery prawns are succulent and highly addictive. Savor this hot and you get a slight crispy coated prawns filled with umami flavors. I am glad this is All You Can Eat because I certainly love repeat orders on this! Well braised, the soft bean curd had a nice soaking of flavors in the classic Ma Po Tofu sauce. Lots of flavors identified from the chilies, black bean and bean paste. If I wasn’t trying to save room for other dishes, I would gladly polish this one off. Ok… we still need some greens to balance out our meal. This one was a good choice as the medium tender French beans had a great breath of wok with full aroma of savory notes. I can taste bits of crunchy textures with juicy bits of meat. Soft pieces of eggplant bathed in a garlic and chili sauce. Only if you like eggplant! Crispy noodles covered in the usual Cantonese starchy gravy filled with shredded chicken, mushroom and vegetables. Simple dessert but always a favorite among everyone. This is what made them famous and the reason is due to the gorgeous soft silky custard of Tau Fu Fa made in house. Spoon on wolfberry syrup for a sweet touch… this is simply a Must-have at Si Chuan Dou Hua!! Yes, we did gluttonize all the above dishes that night! But we didn’t cover all the 60 dishes, so there are more dishes to choose from the menu of the All You Can Eat promotion at Si Chuan Dou Hua Restaurant. It’s really a great promotion if you love varieties and looking to spending some fun and food time with family and friends! For reservations or enquiries, please call +603 2782 8303 or email douhua.prkul@parkroyalhotels.com. Haha, certainly take some gluttons to try that amazing range of dishes! Cheap...and nice!!! Go! Go! Go!